The narrow punch, or sword punch, is a thin straight tool which is used to reach deep into the profile of a part where a relieved or v shaped profile tool would not be able to reach. 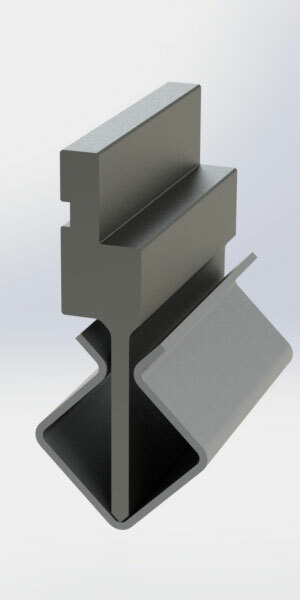 The narrow punch tool is an effective tool when closing a square profile. While the narrow punch is designed to perform one simple task there is some flexibility as to how you use it. Depending on the gauge and design of the profile over bending the last bend of a square profile will allow it to be closed in its final stage. There are two issues that can arise from this. The first is that the over bend can cause the work piece to buckle. The second is that the part will cling to the tool and need additionally clearance to be pulled off of the punch. This technique should be limited to gauges lower than 14 gauge. The major drawback of the narrow punch is that it has no relief for geometry, because its high length to thickness ratio any curve would cause it to buckle and fail. Additionally the maximum tonnage on these tools will be reduced compared to a standard punch. While narrow punches are not versatile they do open a wide range of design options not available with any other type of tooling.